The organization formally known as Hounsfield Test Equipment is renamed as Tinius Olsen Ltd. In January 2004, Hounsfield Test Equipment took the name of its US parent company Tinius Olsen. One of the motives of this one-brand approach was to enable the Tinius Olsen Group to satisfy a much wider range of testing requirements across all industrial sectors and in particular provide a consistent high standard of expertise in materials testing to global customers, many of whom have manufacturing facilities in multiple countries across the world. Hounsfield the engineering company was founded in 1904 by Leslie Hounsfield. Leslie was an outstanding engineer, an inventor with a genuine pioneering spirit always looking to embrace the very latest in technology and trying to use it to enhance people’s lives. As a young inventor Leslie made a living designing and producing pumps. However his first real major project came about when he considered the inefficiency and time wasted by his brother who was a Medical Doctor in General Practice. His brother, a locum at that time, traveled between patients either using a horse drawn taxi, or by bicycle. 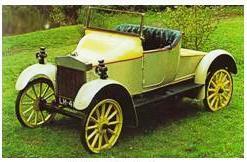 Automobile technology was advancing but only available for the wealthy. 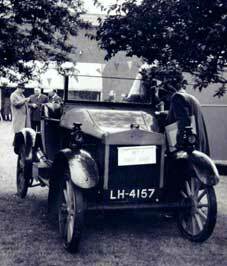 Leslie felt an affordable car would radically improve the efficiency of local doctors and greatly improve the quality of care provided, so he set about designing and building what was probably the first real ‘company car’. The prototype was ready in 1913 but the outbreak of war meant it did not go into production until nine years later. It was called the Trojan and was an instant success; affordable and economical to run. 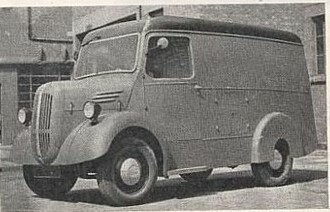 The Trojan was taken up by the Brooke Bond Tea Company who had the standard saloon modified for use as a delivery van. The Trojan was immortalized when the toy manufacturer Dinky brought out a series of model Trojans including one sporting the Brooke Bond livery. Another side of the Hounsfield business was the Safari Camp bed business. Leslie designed an ingenious camp bed which utilized a series of sprung steel supports to stretch a strong tough canvass to provide a very comfortable ‘field’ bed. The light-weight bed, easy to assemble was fist designed for use by the military. 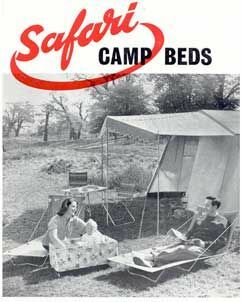 In the 1950’s and 60’s the Safari bed became very popular amongst camping enthusiast. Where did the testing come into this? From the outset as a manufacturer Leslie was totally committed to quality. He was single minded in the need to provide a quality product and he instilled this in the engineers who joined the growing number of staff employed at the Croydon based factory. 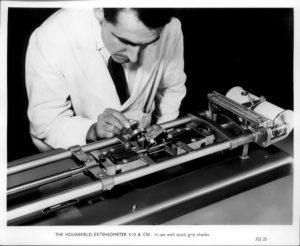 In pursuit of quality the engineers at Hounsfield wanted to test and measure the mechanical properties of the materials and components which were used in the Trojan. In particular the metals, alloys and springs. To achieve this, the Hounsfield engineers needed a Tension/Compression materials testing machine. The only machines available at that time were very large in terms of force capacity and not at all accurate, they were also expensive. For Leslie the solution was easy, design a machine specifically to do the job! The result was the Hounsfield horizontal bench mounted tension testing machine – as pictured here. A screw driven hand operated machine with a maximum force capacity of 20 kN (2000 kg). The machine was ideal, easy to use, reliable and even portable. Leslie presented a series of papers and presentations at the Institutes of Mechanics and Building Research. This was just the testing machine the industry needed. For the first time it was possible to quantify the mechanical and physical properties of materials and components easily, alongside the manufacturing process. Soon Hounsfield was selling hundreds of machines, not just in England, but overseas across the world. Hounsfield became the generic name for a Tension/Compression testing machine. 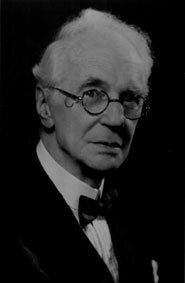 So what happened to Hounsfield’s designs? With the outbreak of World war II Hounsfield, like most engineering companies at the time, turned over its manufacturing facilities to support the war effort. Once over, tough times forced Leslie to sell the Trojan car company to Leyland cars who developed it further and continued to sell the model successfully for a number of years. Even today fine examples of the Trojan are still on the road. 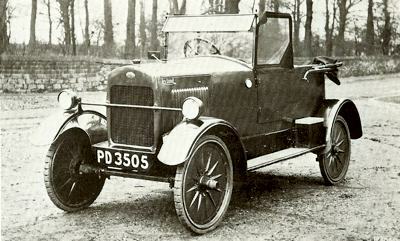 The Hounsfield family retain a Trojan model in perfect working order as does Lord Montague at the Beaulieu Motor Museum in Hampshire. The Safari camp bed business was acquired by one of the UK’s leading leisure and camping outlets. In 1969/1970 part of the testing machine company was sold to Monsanto (Europe) and was moved to Swindon, the remaining part of the company and its premises was retained by the family of Leslie Hounsfield and then became Morland Engineering Limited. The fortunes of the company were restored by a young, skilled engineer Brain Stevens. Brian had trained as an apprentice under Leslie and recognized the still growing need for testing machines in industry and in the 1970’s began to rebuild Hounsfield as a testing machine company. So when did Hounsfield Test Equipment Ltd come around? In 1980 Hounsfield Test Equipment Limited was registered as a testing machine company. This was followed by a series of innovative designs, which drove the company forward. As ever, innovation was key to Hounsfield’s success (At that time Sir Godfrey Hounsfield, a family member, while working at EMI, designed the brain scanner for which he received a Nobel prize in 1979). First came a single column bench mounted vertical Tension/Compression testing machine, the first of its kind and a concept since copied by Hounsfield’s competitors world wide. Then came PC controlled machines, the Pet Commodore, BBC Acorn and the RS232 and IBM compatible machines. 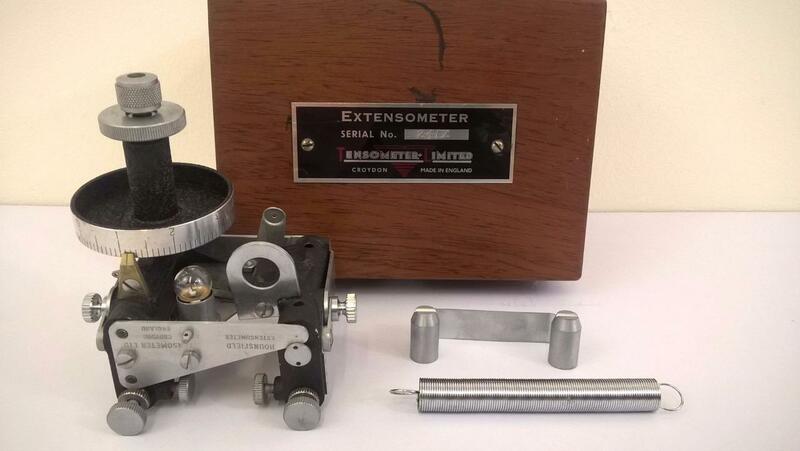 In 1983 the company designed the first laser extensometer, a device used to very accurately measure the elongation of materials in tension using a helium neon laser, again a concept copied by Hounsfield’s rivals. Even today the Tinius Olsen 500L laser extensometer leads the field with its 12 micron resolution scanning the test specimen at 320 times per second. 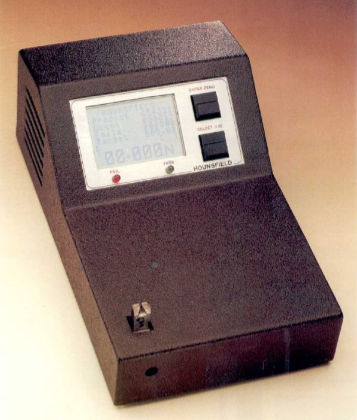 In the late 1980’s the company launched the first fully micro processor controlled testing machine with a built in LCD Touch screen, hard drive and floppy disc drive. The company also released a revolutionary high level programming language HCGL (Hounsfield Control and Graphical Language), this was and still is a language made up of key words and functions which are used by operators to very easily and quickly build test methods and profiles using a regular text editor. HCGL revolutionized the programming of testing machines, test profiles could be built and tested in seconds. In 1991 Hounsfield was fast becoming the preferred supplier of testing machines in the UK, while at the same time developing new markets overseas, the company was presented the Queens Award for Export. Quality engineers joined the company as it grew, the old premises in East Croydon could no longer sustain the growth and the company moved to a new purpose built manufacturing unit close to Gatwick the International airport south of London. (joining the rest of the company which moved in 1990) The company invested in new manufacturing machinery, CNC milling machines, lathes, and its people. Three engineers graduated in Electronic and Electrical engineering from Greenwich University with first class honors degrees and the product development continued on. So where did Tinius Olsen get involved? By 1995 the Hounsfield success had reached the USA. Hounsfield Test Equipment was a serious supplier of testing machines to the US market and this market share, innovation and excellent manufacturing facilities had attracted the attention of the US testing machine company Tinius Olsen. Hounsfield became part of the Tinius Olsen group on companies at the end of 1995, thus providing another successful strategic move by the Hounsfield family and their fellow directors. Investment and support from Tinius Olsen spurred yet another significant period of design and growth in the company’s history. Hounsfield launched a series of new products the LF100 manual pull test unit maximum capacity 100 N, over 320 units have been sold to Ethicon a division of Johnson and Johnson. The S series Tension/Compression machines were launched in 1996, the first testing machines to allow connection of regular parallel printers directly to the machines resulting in an ISO 9000 QA report printed at the press of a button straight from the machine. This was quickly followed by Windows based test software – QMat Pro making data available and fully portable within the Microsoft Windows environment, and then the W series building on the success of the past and presenting manufacturers and education alike with a real testing machine at a realistic price. Throughout, Hounsfield engineers have always and continue to work with leaders in industry developing new testing methods and standards. When did the name change occur? In January 2004, the company changed it’s name to Tinius Olsen Limited, to consolidate the name worldwide with our parent company, Tinius Olsen Testing Machine co, based in Philadelphia, USA. Today Tinius Olsen is the UK’s leading manufacturer and supplier of Tension/Compression testing machines for Research, QA and Education. Tinius Olsen machines are used to perform tests quickly and easily on materials such as metals, plastics, composites, rubber, wood, textiles, paper and packaging, leather, yarns and fibers, toys, belts, wire, connectors, springs, adhesives, foods, finished products and components. The Tinius Olsen machine is the most flexible of test instruments in a laboratory. Using one Tinius Olsen machine it is possible to conduct tension, compression, shear, flex bend, tear, peel, puncture, extraction, insertion and even friction tests. An endless number of tests can be performed to quantify the strength and quality of materials and or components. Some of the more bazaar materials tested using Tinius Olsen machines include rat tendons, ice cream, tooth brushes, bank notes, sutures, baby soothers, dental adhesives, zippers and many more.